Andrew Wiggins scores 24 points as the Timberwolves get the win over the Warriors in overtime, 131-130. Closed his rookie NBA campaign on the upswing, highlighted by being named Western Conference Rookie of the Month for March... Saw action in 60 games overall, including 33 of the final 35; he averaged 4.8 ppg and and 5.0 rpg (in 13.6 mpg) while shooting 49.8% from the floor and 63.4% from the FT line... Started 15 of the final 18 contests, averaging 12.0 ppg and 11.3 rpg in 30.2 mpg and hitting 52.8% (84-for-159) from the floor in those 18 while collecting nine double-doubles... Hit the game-winning shot with :04.6 left Apr. 11 vs. Houston, capping a 12-point, 20-rebound performance... Became the fifth player in Wolves history to record a 20-point/20-rebound game Mar. 20 at Houston (22 pts/21 reb), joining Kevin Garnett, Tom Gugliotta, Al Jefferson and Kevin Love... He's also just the fourth NBA rookie in the past 20 years to accomplish that feat (Joe Smith, Tim Duncan, DeJuan Blair)... Also dealt a season-high four assists in the Mar. 20 game at Houston... Made his first start Mar. 16 vs. Sacramento; the five blocks tied a team season best... Signed to a two-year contract on July 13... Acquired from Utah (along with Shabazz Muhammad) in exchange for Trey Burke in a draft-night transaction on June 27; he was selected by the Jazz in the 1st round (21st overall) of the 2013 NBA Draft. Acquired by the Timberwolves on draft night (June 27, 2013) along with the draft rights to Shabazz Muhammad (14th overall) from the Utah Jazz in exchange for the draft rights to Trey Burke (9th overall)... Selected by the Utah Jazz with the 21st overall selection in the 2013 NBA Draft. Totaled 16 points, 11 rebounds and five steals and hit a game-winning three-pointer at the buzzer in leading Senegal to a 66-65 victory over Team USA Midwest in the 2009 Nike Global Challenge in Oregon on Aug. 8, 2009. 2012-13: BIG EAST Defensive Player of the Year and an All-BIG EAST first team selection... Averaged 8.7 points, 7.3 rebounds and 2.5 blocked shots in six NCAA Tournament games.... An All-Midwest Region selection... Narrowly missed a triple-double in the BIG EAST Championship title game vs. Syracuse with nine points, nine rebounds and a career-high eight assists... Scored a career-high 23 points against Seton Hall (10-of-11 FG), adding eight rebounds and three blocked shots (2/23/13)... In league games only, he led in the BIG EAST Conference in rebounding (10.8 rpg) and was second in blocked shots (2.8 bpg)... In overall statistics, he ranked second in the BIG EAST Conference and 29th nationally in rebounding (9.4 rpg), and third in the league and 24th nationally in blocked shots (2.5)... His 9.4 rebounding average was the highest in 19 years (since Clifford Rozier in 1993-94, 11.1 rpg)... 2011-12: Led the BIG EAST and was eighth nationally in blocked shots (3.2 per game), was third in the league in rebounding (9.1; 45th in the nation) and seventh in field goal percentage (.525)... His 128 blocked shots as a sophomore were a new Louisville single season record... He swatted six shots three times (vs. Memphis, Kentucky, Seton Hall) and seven on three occasions (vs. St. John's, Rutgers, Michigan St.)... Had 11 double-doubles as a sophomore, the latest being 11 points, 13 rebounds and four steals at Cincinnati... His 11 double-doubles were third in the BIG EAST... Named to the BIG EAST All-Tournament team after averaging 8.8 points, 9.0 rebounds and 3.3 blocked shots while shooting 68.2 percent from the field in the four games... 2010-11: Ranked third in the BIG EAST and 53rd nationally in blocks (1.9)... Blocked a shot in 24 of his 29 games as a freshman, with multiple swats in 13 games... Blocked at least four shots in five games, including rejecting five against Seton Hall and at USF in his first two BIG EAST games... Starter at center in 10 games, averaging 6.4 points, 4.9 rebounds and 2.2 blocks in those 10 starts while hitting 26-of-42 field goals (.619)... Produced his first career double-double with 13 points and a career-high 12 rebounds against Connecticut (2/18/11). Born on Jan. 18, 1990, in Kebemer, Senegal... Son of Momar Dieng and Seynabou Diagne... One of eight children in his family...Majored in communication at Louisville... Speaks five languages (Spanish, French, Italian, English and his native Wolof)... Honored at The White House on June 23, 2013 as President Obama welcomed the 2013 NCAA Champion Louisville Cardinals for a celebration... 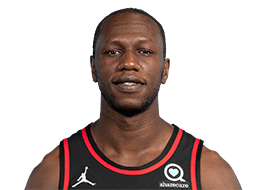 Averaged 15.4 points, 12.6 rebounds and 7.2 blocked shots as a senior at Huntington St. Joseph Prep in Huntington, West Virginia... Enjoys playing video games in his spare time... Twitter handle: @GorguiDieng.